Pay attention: The solar-thermal energy market--which converts the suns energy into hot fluids or steam--is set to take off. 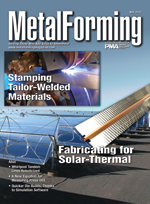 North American metalworkers already are benefiting, fabricating frames, collector panels and absorber fins. The largest dishwasher plant in the world--Whirlpool in Findlay, OH--automates three tandem lines with press-to-press robotics to tackle a new stainless-steel model. Specially engineered destacking systems handle the challenges presented by inhouse blanking with dry-lube application. To support its supplier, F&P America, Hondas North American Technical Group developed a new equation for measuring overall equipment effectiveness, and testifies that effective problem solving starts with a strong data-collection system. ...to minimize assembly and tryout time in the press, allowing this Michigan die shop to move programs through development at lightning speed and free up shop capacity to handle a rapidly expanding customer base.